Selling and re-investing after-tax proceeds in the same or similar stock funds can be a ‘no-brainer’ when going from taxable to tax-free (TFSA) accounts. However when switching from high-to-low MER funds within a taxable accounts additional considerations come into play, such as: the tax on the unrealized capital gain, expected long term return of the fund, the difference in MER between the high (old) and low (new) cost fund. Old rule of thumb of fixed income assets into tax-deferred and tax-free accounts while stocks into taxable accounts may no longer be operative (though still applies to tax-deferred accounts). Since the future is unknown, tax-diversification is also advisable. So if you expect to be in a lower/higher tax bracket in retirement than you are now, then an RRSP/TFSA is respectively more appropriate retirement savings vehicle. But there are all kinds of additional considerations which might lead to situations which may push one into higher tax brackets in retirement (especially when OAS clawback kicks in, which by the way is triggered off ‘Net’ rather than ‘Taxable’ income so previous capital losses are excluded): those expecting to have large tax-deferred (RRSP) accounts there are minimum withdrawal requirements to consider or if one’s income is expected to grow rapidly (e.g. young professional). In such situations perhaps a tax-free (TFSA) account where tax has already been paid on contributions might be advantageous (i.e. use first). But when the employer matches contributions in an RRSP (tax-deferred) account, then it is likely appropriate one to use at least to harvest the employer contributions (i.e. use first). However low income Canadians who expect to be eligible for the Guaranteed Income Supplement (GIS), will find that retirement savings from after tax dollars, i.e. using TFSAs, would reduce the possibility of being disqualified for the GIS. Still, the greatest imponderable may in fact be what the uncertainty of future tax rates until and in retirement (e.g. tax rates/brackets and/or income related benefit adjustments). Given this unknown it may make sense to go for “tax diversification” and split your investments between tax-deferred and tax-free accounts, so that during retirement you will have the flexibility to select from where you draw your income depending on tax and other income considerations. Also, the general rule of thumb used to be is to put interest bearing (and non-Canadian dividend paying stocks), which are taxed higher than capital gains, into tax-deferred or tax-free accounts to minimize taxes, whereas stocks, since they deliver capital gains, should be in taxable accounts. What has changed since 2008 when TFSA was introduced? So the tax owing on $10,000 earning 1-2%/year would be < $100/ year. On the other hand, if you can earn capital gains of 6-8%/year over the long term you can double your money every 10 years or so and before you know it the tax owing on the capital gains (in taxable or tax-deferred accounts) can add up to some real money. So it is well worth exploring potential advantages of putting stock funds into TFSAs and interest bearing instruments into taxable accounts. Many investors feel trapped with high cost investments (MERs=1-3%) in taxable accounts when they have accumulated substantial capital gains over long periods of time. They are reluctant to switch to lower cost investments of the same type because the switch would incur substantial taxes to be paid immediately. Assuming investor’s tax rate on capital gains is constant, then selling and re-investing after tax proceeds in the same or similar stock fund may be a ‘no-brainer’ when going from taxable to TFSA (tax-free) accounts (when cost of funds is the same or lower). However when switching from high-to-low MER funds within a taxable account additional considerations come into play, such as: the tax on the unrealized capital gain (a function of the tax rate and percent of market value which represents unrealized capital gain), expected long term return of the fund, the difference in MER between the high and low cost fund . In Graph 1 above a security is sold in a taxable account and the after-tax proceeds are re-invested in a similar security but with a lower MER but still in a taxable account; in this example the impact of MER differences of 1.32%, 0.82%, 0.57% and 0.32 % are compared (e.g. a fund with MER= 1.5% is replaced with one having MER=0.18%). The difference in outcomes (new vs. old) is examined for a $100K market value in the original fund which includes $50K unrealized cap gain, 6% return and 30% cap-gain tax rate (includes OAS clawback). The after tax difference after 25 years ranges for $50K to -$12K. Graph 2 above compares the effect of various levels of unrealized capital gain embedded into the original fund. As expected the greater the unrealized gain, the higher the associated initial tax and the lower the reinvested assets. But for a 1.17% difference in MERs shown here between the old and new funds can be substantial after 10 years even when unrealized gain at starting point is 75% of market value. Graph 3 shows the enormous effect of moving a fund from a taxable account to a tax-free (TFSA) account for a long term investor. After 25 years in this example the after-tax difference in outcomes ranges from $100K-$160K for the original $100K pre-tax market value of the fund. 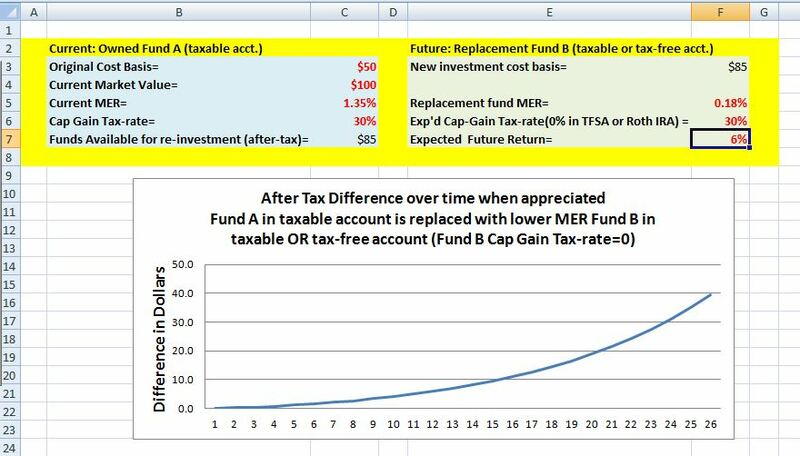 Expected Future Return (Funds A and B are similar asset types so are expected to have similar/same returns except for the drag associated with the different MERs. Moving stock funds (even with substantial capital gains) from taxable to TFSA (tax-free) account the after-tax benefit can be immediate due to two factors: all future gains and dividends will be tax free and future returns will be higher due to lower cost of (similar) funds. Consider whether it makes sense for you to replace high cost funds with lower cost ones, not just within tax deferred and tax free accounts, and moving from taxable to tax-free accounts, but even within a taxable account when you have substantial capital gains and paying associated taxes payable in taxable accounts; it all depends on embedded unrealized capital gain, the tax-rate, the expected return and the MER (fund cost) before and after the switch. Try the spreadsheet on your example; it is relatively simple to use. Tax rates may increase or decrease for tax-free, tax-deferred and taxable accounts, so tax-diversification should be considered by most.